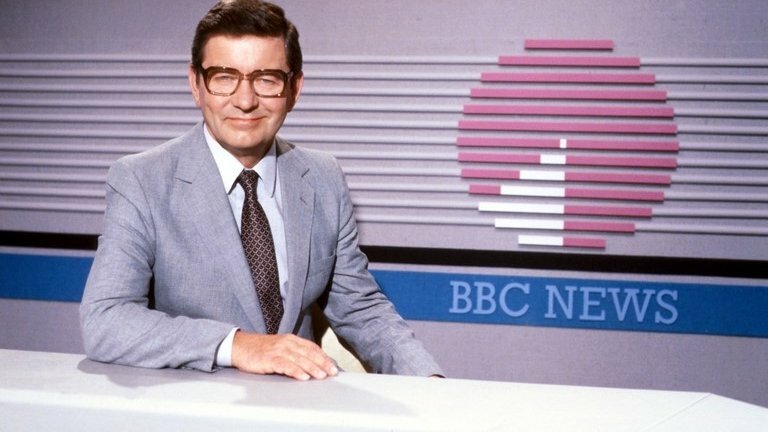 The voice of Richard Baker introduced the first news bulletin broadcast on BBC television. But it was a year before he was actually seen on screen, going on to become one of the most familiar faces on TV. A keen music lover, he branched out to present the Last Night of the Proms and was a regular on the panel game, Face the Music. He also presented music programmes for BBC radio as well as voicing the popular children’s series, Mary, Mungo & Midge. Richard Baker was born in Willesden, north London, on 15 June 1925, the son of a plasterer. His father was a keen amateur singer who encouraged his son to take up the piano. Academically gifted, Baker won a place at grammar school before going to Peterhouse College, Cambridge, to read history and modern languages. Two terms into his university education, he joined the Royal Naval Volunteer Reserve. He found himself on a minesweeper attached to the supply convoys to Russia, one of the most dangerous and gruelling theatres of the conflict. He whiled away the time by reading Tolstoy’s War and Peace, as well as collating information about his then admiral, Sir Gilbert Stephenson, which formed the basis for a biography Baker later published on this pioneer of anti-submarine warfare. The war over, he returned to his studies at Cambridge, where he became an enthusiastic member of the Marlowe drama society. On graduation he began acting in various repertory companies and secured a short attachment as an English teacher in a London grammar school. In 1950, he wrote to the BBC asking if they were recruiting actors, resulting in an offer of a job as a presenter on what was then called the Third Programme, much later to become Radio 3. It was a dream job for the young man with a deep interest in classical music. When the news department began planning bulletins, Baker and Kenneth Kendall were recruited and it was Baker who introduced the first BBC news bulletin on 5 July 1954. The bulletin itself was read by the doyen of radio announcers, John Snagge. When ITN prepared to go on air with named newscasters in 1955, the BBC relented – to the extent that it allowed Baker and Kendall to appear on the late-night TV news summary. “It was hoped not too many people would be watching,” Baker said wryly. Two years later Baker, along with Kenneth Kendall and Robert Dougall, became the regular faces of BBC TV news bulletins. Baker’s calm and unflappable style proved invaluable in the days when technical problems often bedevilled the bulletins. The scripts on the Autocue, from which the presenter read, were held together by sticky tape which often peeled away. Film footage shot on location, which had to be couriered back to the studio, sometimes failed to arrive on time or, if it did, the film broke or the machine failed, leaving an embarrassing gap. Inevitably, despite the wishes of BBC management, the newsreaders became personalities in their own right, purely because they were appearing in the nation’s living rooms every night. Baker recalled being sent jumpers knitted by adoring fans and he began to be recognised while out shopping. However, newsreaders in the 1960s were not paid the star salaries of the current generation. Baker’s son Andrew recalled family holidays in a caravan on a farm, the cost of foreign travel being prohibitive. In 1969 he was narrator of the BBC children’s series, Mary, Mungo & Midge, which ran for 13 episodes, and he later narrated another children’s series, Teddy Edward. Baker’s high profile led to three guest appearances on Monty Python’s Flying Circus and, in 1977, he joined other BBC presenters to take part in a performance of the song, There is Nothing Like a Dame on the Morecambe and Wise Christmas Show. In 1982, he decided to leave the TV news desk but his voice continued to be heard on BBC radio where he presented, among other programmes; Start the Week, These You Have Loved and Your Hundred Best Tunes. For many years he fronted the Last Night of the Proms from the Royal Albert Hall, resplendent on a balcony festooned with streamers. In 2015, along with other veterans of the North Atlantic convoys, he received the Ushakov medal, to recognise the bravery of British sailors in the service of the Russian navy. He would read all the newspapers and cut out the interesting headlines. Then, at Six O’clock, he would read them aloud to his fellow residents over supper. For the great news man it was a smaller audience than he was used to; but one which was no less appreciative of his talent.